I've been laid up for the last eight days with a terrible cold, and as such haven't been able to put in any time on my Cherry Can painting. This has really put me behind on the work I need to do for the show at Twinhouse in February, but what can you do. Rather than let my blog languish un-updated I thought I'd post something fun from my past. I recently received an email from someone who used to frequent our type/design shop Pace Typography in the late 80's. In his letter he mentioned how much he had enjoyed my calenders. I hadn't thought about them in a long time, so I got them out, and looked them over for old time sake. 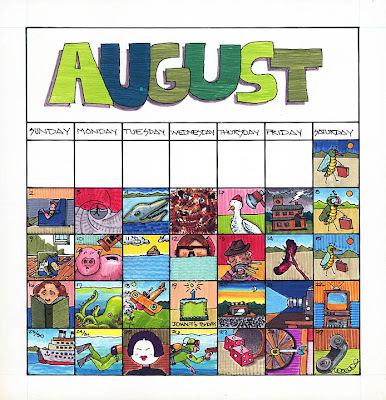 Each month for one year I created a calendar shell, and in each square I'd draw a little picture representing the most significant event of the previous day. Then, I'd color them with markers. Each square was about 3/4 of an inch in size. A lot of these days had no event more significant than working, and maybe watching television that night. 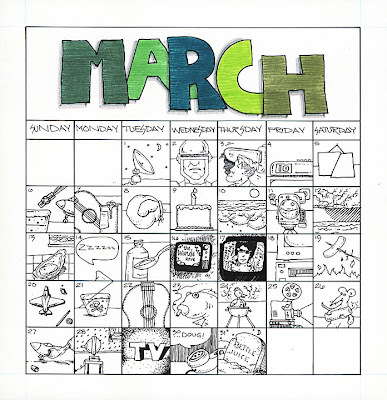 March of 1987 was the last month I did this, and as you can see I never found the time to color that month in. The images are rather cryptic, and I've forgotten what a lot of them are supposed to mean. We did go to a lot of movies in those days. A lot of movies. I was also spending a great deal of time building scale aircraft models. Both of which are heavily represented above. Anyway, I thought it would be fun to post my first "painting a day" effort. I have a lot of fond memories of Pace Typography. It was a wonderful experience working everyday with my best friend Michel Valin. He and I worked really hard, never made any money, but for nearly eight years I looked forward to going in to work each day. Many of our clients would come to pick up their jobs, and then would just stay and hang out. People didn't want to leave, even occasionally joining us for lunch. A number of those clients have become very close friends. 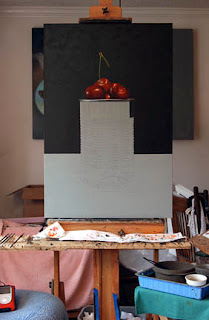 I'm back at work now on the cherries, so I should have a new progressive image up soon. Happy New Year - you all! For the last few years my annual Christmas card has been derived from modifying one of my old "cow" paintings in Photoshop. Basically transforming a pastoral scene into a winter landscape. I thought this year, in addition to creating hard copies to be sent via snail mail to family and friends, I'd also post it here on my blog, as a sort of "e" card to everyone who has taken the time to visit and comment in 2007. Thanks again everybody. I hope you all have a happy holiday season. Oh and, Merry Christmooooooooos! 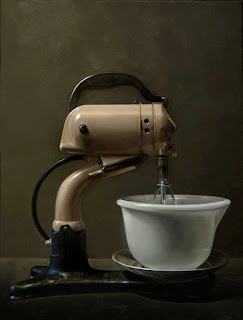 The prediction in my last post, as to the subject of my next painting, was that it would probably be a percolator. This has turned out not to be the case. I've had this particular composition on my mind for some months now, and decided that it was time to give it a try. Cherries have been a re-occuring theme in my work for years, but this is the first time I've painted a cherry the size of a grapefruit. This piece could take some time, so I've decided to post a series of "in progress" images. The image above is the end of day one. To do this is a bit like exposing your soft underbelly to the wolves, but I find it interesting when I see these transitional shots on other artists blogs, so I'm trying to suppress my fears, and present my process. I'm a little fearful of the can, with its extensive series of parallel ridges. It will be a challenge to get "right". If it works I think it will be very cool, if not . . . . ? Hopefully the next post will include an image of the satisfactory completion of the underpainting of that can. Every once in a while I get into a painting that just doesn't want to cooperate. Fortunately it doesn't happen too often, but this has been one of those paintings. I've been working on it so long now that I don't even "see" it anymore. I can't tell if it works or not. Karen says it's really good. I did the overnight test, where I tell myself to wait until the next morning to make a value judgement. When I saw it in the light of a new day, I was "less" negative about it. I still don't know if I got it with this one. Jeff Stricoff at Stricoff Fine Art, Ltd. was excited to have it, so there's a second positive opinion. I believe I'll just have to get away from it for a while, then after a few days see if it starts to grow on me. I'm still working out the details with Plus One Gallery in London, but I think I can safely say that I'm in! They have three of my small pieces now, which they tell me they love, but "would really like some larger work". Until we figure out the logistics of our relationship I am going to hold out on sending any new paintings, but I'm confident enough to begin work on a larger painting that will be slated for their gallery. The director and I spoke over the phone last week, and I don't think what we have to deal with could break our new association. They haven't put my name on their website as yet, but I have added them to mine. Couldn't wait to do that. These next few paintings will probably be larger pieces requiring significantly more time to complete than my earlier work. Because of this I may post more "in progress" images to keep the blog current. I haven't decided on the subject of my next painting as yet, but at this point it looks like it will be a "big" percolator. 2. I once produced a short lived movie magazine called Cinemondo. It was the brainchild of our friends Burk Sauls and Kathy Bakken. The production team also included my best friend at the time Michel Valin (now my brother in law), and my wife Karen. 3. I've seen Stanley Kubricks 2001: A Space Odyssey over 60 times. 4. Once a year I allow myself one entire family size bag of Cheetos all for me by myself. (These are always eaten when Karen is not at home, and at a single sitting. 5. This may seem blasphemous to admit on an art blog, but I enjoy woodworking more (much, much more) than painting. Now that I paint full-time I do not have time for it, but retain wonderful memories of building furniture. You can see a few of those pieces here.